The 2018 5th Edition Spin City Pole Bible is a great reference book for pole fitness enthusiasts worldwide. With over 400 pages and 1600 photographs of pole moves! The 2018 5th Edition Spin City Pole Bible is a great reference book for pole fitness enthusiasts worldwide. With over 400 pages and 1600 photographs of pole moves, useful hints and tips, strength and conditioning exercises and combinations from a beginner to advanced level, this is the perfect companion to your pole training. Delivery can take up to 5 working days (UK) up to 10 working days (EU) and up to 28 working days (International). Please ensure you choose the CORRECT POSTAGE option. The PDF is an ELECTRONIC file and will be available to download from your on-screen order confirmation. A copy of the download link will also be sent in the the order confirmation email which should arrive within 24 hours of purchase. Please note if you are ‘back ordering’ a book, this means the book is currently out of stock and will be posted once it has been restocked at Spin City HQ. You will receive an order completion email to inform you when your item has been posted after which point the above delivery times will apply. This book aims to provide you with all you will need to know about ante and postnatal training for pole and aerial fitness. From the anatomy of pregnancy to the benefits and risks of exercise, current guidelines and specific training programmes, it will help guide you through your pregnancy journey. A Little Book of Handstands is split up into 14 Chapters starting with simple upright hand balances and then taking you all the way through to one handed handstands and contortion handstands! It flows in a chronological order to help you work your way up and conditioning your hand balancing in the best order. You do NOT have to handstand to buy this book; it contains lots of wall balances, conditioning, entries and exits too! Suitable for all levels. 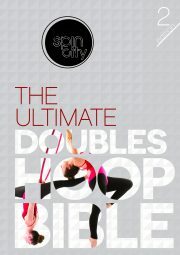 The Spin City Doubles Hoop Bible is a great reference book for aerial hoop enthusiasts worldwide. With over 800 photographs of doubles hoop moves and combinations from beginner to advanced level, this is the perfect companion to your doubles hoop training. How long does it take to handstand? Why exactly are handstands so popular? What are the benefits of learning to handstand? 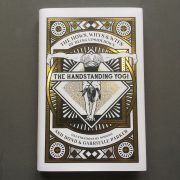 The Handstanding Yogi is an illustrated travel companion on your journey to a safe and successful inversion practice. It is fun, frustrating, wildly joyful, unashamedly geeky and a little bit sweary. Much like handstands themselves.